I’ve made regular dinner rolls often. 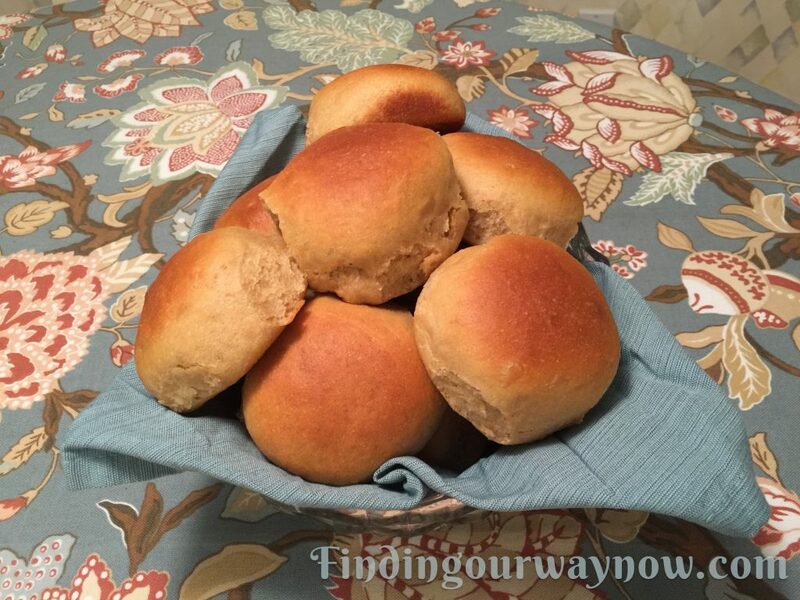 I wanted to create a whole-wheat rolls recipe but hadn’t had the time to work on it until now. We were out and about shopping at a local discount store that carries kitchen items and supplies. As I was waiting to check, out, my husband approached with this huge bag of whole-wheat flour. It was cheap enough, so I decided to take a chance. On the back of the bag was a recipe for whole-wheat rolls. The recipe had much to be desired, leaving much to the imagination. It was my inspiration to work on homemade whole-wheat rolls. The flour was some of the best white whole-wheat flour I’ve come across. I found there was no need to mix it with unbleached all-purpose flour to lighten it up. 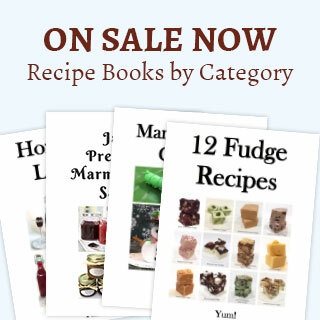 I went to work, did a bunch of research and was able to come up with a recipe that filled in the gaps that all my taste testers loved. Lightly butter a baking sheet and lightly oil a medium size bowl and set both aside. In a large warm bowl, lightly whisk ½ cup of warm water, sugar, and yeast, and allow the yeast to soften for about 5 minutes. In a separate bowl, combine the oil, honey, eggs, salt, milk and hot water. Mix until well blended. Add it to the yeast mixture and then add all the flour. Mix until combined. The dough will be quite sticky. Allow it to rest for 15 minutes. Dust your countertop with flour. Turn the dough out of the bowl and knead it with flour-dusted hands 10 to 15 times until you’ve achieved a smooth ball. Place the ball of kneaded dough in the oil-coated bowl. Allow it to rise until double in size, about 40 minutes to an hour. Punch the dough down and turn it out onto a flour-dusted surface and knead 10 to 15 times until it’s smooth and satiny to the touch. Place it back in the oiled bowl and allow it to rise again until it’s doubled in size, about 40 minutes to an hour. Gently turn the dough out on the counter. Form the dough into 20 to 24 balls, tucking the sealed side down on the prepared baking sheet. Allow the rolls to rise for about 30 to 45 minutes. Preheat the oven 350° F. Bake for 20 to 25 minutes. Allow the rolls to cool on the baking sheet. Pull them apart and place them in a bread-basket and serve immediately. Store any leftover yeast rolls in a plastic bag. To warm your large bowl, run hot water over the surface of the bowl until it’s warm to the touch. Thoroughly dry before use. If you store the rolls right after baking, make sure they are completely cooled before placing them in a plastic bag to avoid condensation. When you have leftover rolls, they can be reheated by wrapping them tightly in aluminum foil and warm at 325° F for 2 to 5 minutes. The amount of time will depend on how may rolls you’re reheating. Notes: This flour can be found at many recognized retailers. Use their website search tool to locate the retailer who carries it where you live. The amount of sweetener you use is your choice. I prefer miine less sweet and more like rolls than cake. You may increase the honey but here is the rule. Do not use any more than ½ cup of honey. But I’ll warn you, that much honey makes them REALLY sweet. So use the amount of sweetener to suit your taste. I found that three tablespoons of honey provided an excellent balance of flavors. To get each roll the perfect size, I would suggest using a scale. 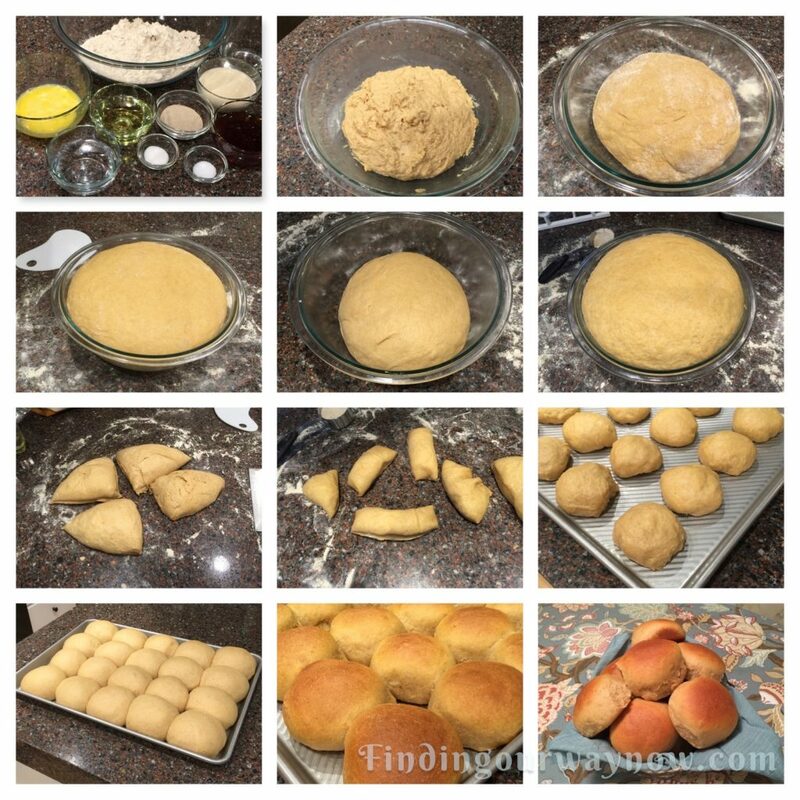 Weigh the prepared dough and then divide that number into the desired number of rolls you desire. Then pull off a bit and weigh it, adding a bit of dough to reach the right weight. If you’re like me, you’ll just guess. This whole-wheat rolls recipe may take a bit of work, but they’re worth it. They also make excellent hamburger or sandwich buns when I make them the right size. 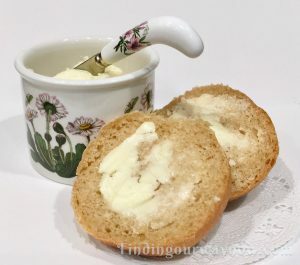 However you use them, they are oh so good when you add a dollop of my homemade butter on them. Next up, my homemade butter. It’s way too easy to believe.